Yeah, but: It's so fluffy! 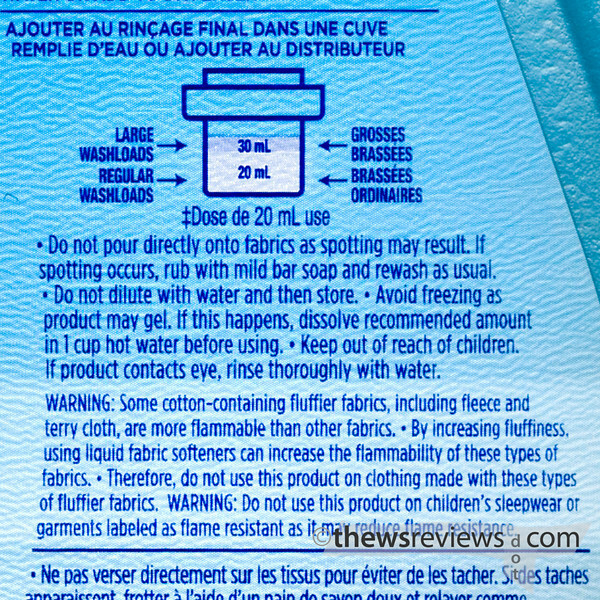 The Long Version: Perhaps I shouldn't be so surprised at how hard it is to find decent information about fabric softener. After all, it's an industry worth a huge amount of money that involves complex chemicals and heavy perfumes. On one side of the information chasm we have the manufacturers whose only advice is how to use more of their product, while their adversaries love the cliché "chemical-laden". That's a scary phrase that's completely meaningless, as even a glass of pure distilled water is laden with hydrogen and oxygen, which are combustible, reactive, and/or poisonous chemicals that can kill you if not handled correctly. The foundation of most softeners, ditallow dimethyl ammonium chloride (DTDMAC) (pdf) certainly isn't something I'd want to drink. Norway has it on their list of priority substances to reduce, a list that include[s] substances that are persistent and bioaccumulative, that have serious long-term health effects, or that show high ecotoxicity. The additional additives and other ingredients almost certainly don't improve matters; there's no doubt in my mind that this isn't something I should enjoy pouring down the drain. I compensate for that by adding it only when it will actually be useful - I wash my shirts separately from my jeans in the world's smallest front-load washer - and by using about a fifth of the recommended amount. Even with that level of moderation it still takes care of the static electricity that's endemic in winter. But in a market filled with dubious information and spin, sometimes companies rise to the level of art. 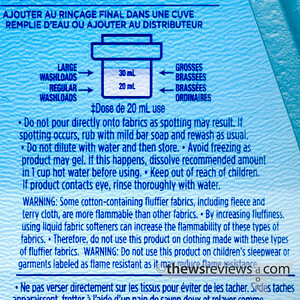 All bottles of fabric softener have this handy disclaimer on their backs. 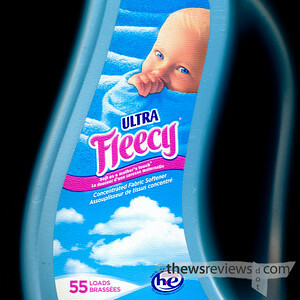 Essentially, fabric softeners increase fluffiness and flammability, so it should not be used on inherently fluffy fabrics like fleece and terry cloth, or on anything that needs to be treated for flame-resistance, such as "children's sleepwear". Yet the photo on the front of the bottle that I bought looks like a scary aryan robo-baby wrapped up in a fluffy fleece blanket. I have to admit that this absurdity is the only reason why I picked this particular brand out of the noise of indistinguishable products. How on earth did you unearth any of the ingrediants? I have to admit that it took far longer to find out any ingredient information than I expected, and then even harder to track back to reputable sources of information about the chemicals. And to be clear, I don't know if Ultra Fleecy uses DTDMAC, only that it's the principle component for most fabric softeners. Something that can be interesting is to search for WHMIS information - Workplace Hazardous Materials Information System. Anything that's even mildly toxic that's used in a workplace should have this standard reporting available for it. Naturally, it's concerned with workplace safety and not environmental toxicity, but it's a good starting point.